September is Cholesterol Awareness Month, so let’s take a closer look at what cholesterol is and how we can make sure we keep healthy levels maintained in our bodies. Cholesterol, in and of itself, is not bad. Cholesterol is a waxy substance that is found in all of our body’s cells. We need cholesterol in our bodies to maintain many normal physiological functions, including the production of new cells. However, there is good and bad cholesterol. High-density lipoproteins (HDL) are the “good” cholesterols. These molecules help to control excess cholesterol in your blood by collecting it and carrying it to the liver where it is broken down and processed out of your body. 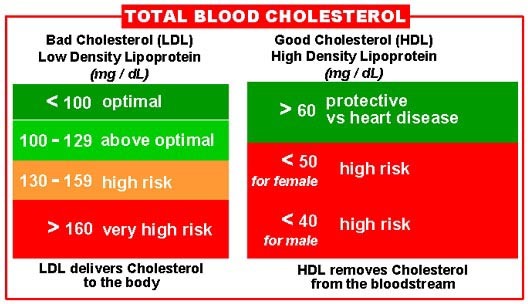 The higher the level of HDL in your blood, the less “bad” cholesterol you will have. Low-density lipoproteins (LDL) are the “bad” cholesterols. These molecules carry cholesterol to the many organs and tissues in your body that require it. However, if your body has excess LDLs, the excess continues to circulate in your blood, and, overtime, it will begin to build up on your blood vessel walls and collect as deposits called “plaques.” These plaque deposits cause your blood vessels to narrow, and blood flow is restricted. This can lead to high blood pressure and coronary artery disease. Acupuncture and Chinese herbal medicine can play a role in helping you to maintain healthy cholesterol levels by approaching you as a whole person and correcting the underlying imbalances in your body. There are four common patterns we see in Chinese medicine that correspond with high cholesterol. Often these patterns can be distinguished based on other conditions a patient may have, such as difficulty losing weight, heart disease, arthritic changes, or inability to digest and assimilate food properly. Our bodies are very complex, and, in most cases, a combination of these patterns will be present in any one individual. Treatment with both acupuncture and herbs will yield the best and most lasting results. It is always important, however, to keep up with blood work via your primary physician to make sure that your cholesterol levels are in a good range. Diet and lifestyle also play a crucial role in maintaining proper cholesterol levels. The Mayo Clinic has put together some wonderful information regarding the top five diet and lifestyle choices that can help you maintain proper cholesterol levels. I have reposted the information here for your convenience. Oatmeal contains soluble fiber, which reduces your low-density lipoprotein (LDL), the "bad" cholesterol. Soluble fiber is also found in such foods as kidney beans, apples, pears, barley and prunes. Eating fatty fish can be heart-healthy because of its high levels of omega-3 fatty acids, which can reduce your blood pressure and risk of developing blood clots. In people who have already had heart attacks, fish oil, or omega-3 fatty acids, reduces the risk of sudden death. Doctors recommend eating at least two servings of fish a week. The highest levels of omega-3 fatty acids are in mackerel, lake trout, herring, sardines, albacore tuna, salmon, and halibut. You can take an omega-3 or fish oil supplement to get some of the benefits, but you won't get other nutrients in fish, like selenium. If you decide to take a supplement, just remember to watch your diet and eat lean meat or vegetables in place of fish. The Food and Drug Administration recommends using about 2 tablespoons (23 grams) of olive oil a day in place of other fats in your diet to get its heart-healthy benefits. To add olive oil to your diet, you can saute vegetables in it, add it to a marinade, or mix it with vinegar as a salad dressing. You can also use olive oil as a substitute for butter when basting meat or as a dip for bread. Olive oil is high in calories, so don't eat more than the recommended amount. Margarines, orange juice and yogurt drinks with added plant sterols can help reduce LDL cholesterol by more than 10 percent. The amount of daily plant sterols needed for results is at least 2 grams — which equals about two 8-ounce (237-milliliter) servings of plant sterol-fortified orange juice a day. Cut back on the cholesterol and total fat — especially saturated and trans fats — that you eat. Saturated fats, like those in meat, full-fat dairy products and some oils, raise your total cholesterol. Trans fats, which are sometimes found in margarines and store-bought cookies, crackers and cakes, are particularly bad for your cholesterol levels. Trans fats raise low-density lipoprotein (LDL), the "bad" cholesterol, and lower high-density lipoprotein (HDL), the "good" cholesterol. Although your doctor may have told you to lower your total cholesterol, it's important to raise your high-density lipoprotein (HDL) cholesterol, which is known as the "good" cholesterol. It might sound like a mixed message, but reducing "bad" low-density lipoprotein (LDL) cholesterol and increasing HDL cholesterol is a great way to lower your risk of heart disease. Your lifestyle has the single greatest impact on your HDL cholesterol. Even small changes to your daily habits are extremely beneficial to help raise your HDL levels. Don't smoke. If you smoke, quit. Quitting smoking can increase your HDL cholesterol by up to 10 percent. Lose weight. Extra pounds take a toll on HDL cholesterol. If you're overweight, losing even a few pounds can improve your HDL level. Get more physical activity. Within two months of starting, frequent aerobic exercise can increase HDL cholesterol by about 5 percent in otherwise healthy sedentary adults. Your best bet for increasing HDL cholesterol is to exercise briskly for 30 minutes, five times a week. Examples of brisk, aerobic exercise include walking, running, cycling, swimming, playing basketball, raking leaves — anything that increases your heart rate. You can also break up your daily activity into three 10-minute segments if you're having difficulty finding time to exercise. Choose healthier fats. A healthy diet includes some fat, but there's a limit. In a heart-healthy diet, between 25 and 35 percent of your total daily calories can come from fat — but saturated fat should account for less than 7 percent of your total daily calories. Avoid foods that contain saturated and trans fats, which raise LDL cholesterol and damage your blood vessels. Monounsaturated and polyunsaturated fats — found in olive, peanut and canola oils — tend to improve HDL's anti-inflammatory abilities. Nuts, fish and other foods containing omega-3 fatty acids are other good choices for improving your LDL cholesterol to HDL cholesterol ratio. Drink alcohol only in moderation. If you choose to drink alcohol, do so in moderation. This means no more than one drink a day for women and everyone over age 65, and two drinks a day for men. Older PostCan acupuncture work for you?